Brakes are an essential part of any car, motorcycle, or truck and they always need to be in full working order. Quite literally, if they stop working altogether or just enough to lengthen the braking distance too far it makes the difference between life and death. It is very foolish to knowingly drive a car or a truck which would be unable to stop in the event of an accident or a potential emergency. Whenever possible, people should take their auto to a local garage such as ours to check that it is in full working order, and so that any defective or worn out parts can be replaced as soon as is practically possible. 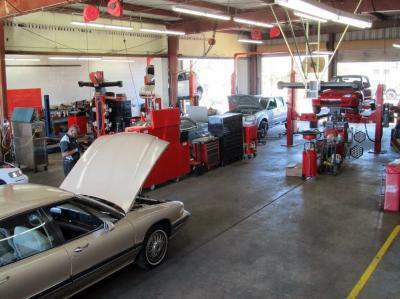 We are a garage that is fully committed to ensuring the safety of our customers, their passengers, other motorists, as well as pedestrians, by offering Apache Junction, AZ brake repair. Our mechanics are experienced in spotting faults. Sometimes faults are discovered when we are carrying out regular services on our customers' cars. For example we might discover that the fluid has leaked, or that a line has been completely cut, or that it is on the verge of breaking into two halves. Customers come to us asking if we need to carry out Apache Junction, AZ brake repair if they notice that it is taking longer to stop their cars. Others suspect fluid has been leaking and when they top it off they notice it has leaked again. If you live in our area and you suspect anything is wrong with your car bring it in for us to examine. As the old saying goes, better safe than sorry.